But the questions we have to ask ourselves are for instance: was their act useful? Were the premises of their thinking, the understandings they had of the situation and which induced them to burn themselves, at all accurate? Again, Buddhism is about questioning and so is scientific analysis. Q: Is there a background within Buddhism that supports an act of self-immolation? For instance Jamyang Norbu¹ as well as Robert Barnett of Columbia University² found that it would resonate with the Buddhist tradition. Jamyang Norbu, a Tibetan writer and political activist recently started to call Tibetans who burn themselves even “Martyrs”.³ Does such a concept of Martyrdom exist in Buddhism? A: “Resonate”? Well, that sounds very smart, but I’d be very careful with such analogies. Accuracy needs a terminology with solid roots in tangible reality. Without that we risk opening the gate for all kind of emotional discourses, political agendas, or creative narratives. These may cater for a ‘good story’ or for political agendas, but they are hardly helpful for an analysis-based approach, which is what we want to do here. So we need to reflect upon words and make sure they are well anchored in facts. Let’s leave ‘resonance’ aside and go into reasoning. The idea of martyrdom in the primary, religious sense of the term is totally alien to Buddhism. It is instead deeply ingrained in the Abrahamic religions, like Christianity, Judaism and Islam, where it neatly connects to the idea of a personal, absolute god who defines right and wrong and whose assumed word stands far above any law made by man. Contrary to this, in Buddhism it is the individual who carries the responsibility for deciding what is right and what is wrong, and there is also no absolute right and wrong, it all depends on the circumstances. That qualifies a lot of the certitudes about what is worth dying for. Then, there is also the idea of retribution that matters a lot in the Abrahamic religions, with a god who punishes and rewards as well as the idea of a realm in heaven etc. Finally, there is here the idea of man being sinful and suffering redemptory. So, these are worldviews and understandings of human ethics fundamentally opposed to Buddhist concepts. Martyrdom as we normally understand it in the religious sense, can in no way be anything Buddhist. To take up the musical analogy mentioned before, martyrdom does not resonate at all with Buddhism. It is, in fact, very much dissonant from it. 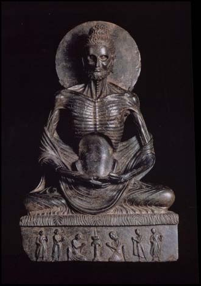 A Gandhara image of Siddharta Gautama, the Buddha to be, showing his body after six years of extreme self-mortification. Siddharta Gautama gave up extreme asceticism and after his enlightenment he taught a “Middle Way”, that is free from the “two extremes: sensual indulgence and self-torture”. This being said, if the concept of martyrdom has no place in Buddhism, this does not necessarily mean it must always be alien to Buddhists. Dying for a cause, or political martyrdom in the more usual terminology of self-sacrifice, is a universally understood idea that everyone can relate to and put into practice. It is not necessarily and in fact only very marginally related to religion. You can be a communist and self-sacrifice for the revolution. But we have to make a clear distinction between the realm of religion and ethics as validated by Buddhism and the realm of politics. Unfortunately, in the discussion these two have been very often mixed up. Now, of course, a Buddhist can choose to self-sacrifice and find justification for that in the Buddha’s Dharma. There is a possible bridge here, but that comes with many qualifications, many ‘ifs’, which make the bridge very narrow. Central here are the Buddhist concepts of responsibility and compassion, but also those of balance and moderation. If, after due consideration, you have come to the conclusion that a political regime is oppressive for people and for religion, then Buddhist ethics certainly do not contradict overthrowing it for the benefit of all, and that might even incur the risk of losing your life. Buddhism is primarily about spiritual realization, not political justice, but compassion as it is taught in Buddhism can very well relate to political activity. Note that we are speaking here about the warm-hearted but cool-headed approach of the Bodhisattva, compassion and wisdom. That is significantly different from a compulsive sense of god-given duty that is more inclined to be passionate—and ultimately selfish. It has to be embedded within other considerations, which come with Buddhist teachings. Buddhist ethics tend to be very flexible and practical but also very concrete. We are speaking here for instance about adverting danger from innocents, taking their suffering on oneself, or choosing the lesser of two evils. The more immediate the objective is, the more it is justifiable. All sentient beings are suffering in samsara, but I just can't take all of it on my own shoulders. The aspiration to do so is central to the path of the Bodhisattva, but it doesn't mean I actually can do it or it would be in any practical way feasible. Then, there is also a strong idea that human life is something extremely precious, both your own and that of those you might harm–even if they are clearly evil. It is something you cannot simply throw away without giving it very, very deep considerations and balancing different aspects. So, in Buddhism, before I give up my life for a given political goal, I must be very sure that this happens out of pure compassion and not, for instance, when some nationalist super-ego is involved. I must be sure that there will be tangible, positive results, instead of vague and poorly considered idealism. Otherwise, it would be considered more beneficial and ethical to continue living and take on suffering for the sake of making a bad situation good. Also, there is a huge step between accepting the possibility of dying, while pursuing a reasonably altruistic goal, and actively suppressing my life, killing myself, for what I believe to serve this altruistic goal. Most importantly, I must be absolutely sure that my motivation is pure. Motivation is very central, because it is well understood that human beings have only a very limited scope of knowledge and wisdom to operate within. Unless we’re enlightened beings, we cannot appreciate all the consequences of our acts and we cannot possess full understanding of a given situation. Therefore, all we are left with is our motivation, because that is something only we can have full access to. Others can guess our motivations, but only we ourselves can really know it. In principle even killing another sentient being can be a positive karmic action or an act of love or compassion, if it happens with the right motivation and the right possible knowledge of the situation, as well as under the right conditions. Nothing is unthinkable in Buddhism—that’s the beauty of it. However, from a Buddhist perspective, first of all, we have to appraise the situation, consider all options, and also verify our motivation before taking any step in life. It goes without saying that this is particularly important in a central decision like the one of taking our own life. 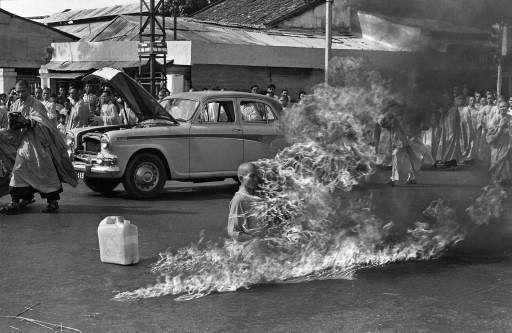 Thích Quảng Đức in the full photo of his self-immolation, during which he remained perfectly still. It was a Pulitzer Prize-winning photograph by Malcolm Browne. Q: You said that martyrdom is not a Buddhist concept, but did not for instance the Tibetan king Yeshe Öd offer his life as a martyr for the sake of Buddhism? He was held in detention by another king and could have saved himself from prison and death, however he instructed his nephew to not pay the requested ransom and use the money instead to bring the great Buddhist saint Atisha to Tibet. A: Again, we need a precise terminology here. Assuming the historicity of the story, I would put Yeshe Öd in the category of self-sacrifice, but not that of martyrdom. These are two different concepts. A martyr suffers, there is an emphasis on the suffering aspect. He suffers in order to fulfill God’s plan, he makes himself a tool for God’s invisible hand. Or, he accepts the most horrible tortures for not renouncing his God. A martyr accepts the trial God submits him to. Etymologically, a martyr is one who bears witness for his God, the real God. Not every altruistic act involving sacrificing one’s life is martyrdom. Yeshe Öd balances his life against Atisha’s coming to Tibet. He figures out the latter is a much higher good than the former, and hence he chose not to save his life. There is an element of pondering, of pragmatic calculation; it is almost a ‘deal’. We may call that martyrdom and that sounds grand indeed, but that would also blur the character of two rather different concepts. Certain is, that sacrifice of Yeshe Öd is not related to politics and it’s objective is certainly altruistic, but also very immediate. If Yeshe Öd accepts dying, then Atisha will come to Tibet and Buddhism will spread. Q: In the discussion about Tibetan immolations one argument has very often surfaced, that relates to the Jatakas, a text which describes the previous lives of the Buddha before he reached enlightenment. A particularly popular episode is the one where the Buddha offers his body to a starving tigress who is too weak to provide food to her tiger cubs. A: Yes, at the popular level this episode is the archetype of Buddhist compassion, every Buddhist child has heard this story. But two things have to be remarked here. First, one might question whether the Jatakas should be taken literally. In the first place these are pedagogical tales, allegories, edifying stories illustrating principles, not treaties on Buddhist ethics and compassion. And, for this purpose, they are full of very much overdrawn situations, much remote from everyday life. I mean, how often do you meet a hungry tigress and her cubs? Real life is certainly both more normal and more complicated than it is depicted in the Jatakas, because it is not the purpose of the Jatakas to provide an accurate picture of life in general, but to make moral concepts and aspirations understandable to anybody. Now, understanding philosophical concepts and internalizing ethical principles might make better and stronger human beings, but true wisdom is about combining these with real-life experience. Whoever wants to explain or even justify self-immolations with the episode of the hungry tigress in the Jatakas has a very superficial, if not simple-minded, understanding of Buddhism. Second, even in the Jataka episode in question, the sacrifice of the Buddha has a very existential impact in that it preserves the life of others, here the cubs’. You can compare that with what, for instance, a rescuer in a catastrophic situation does. But it is quite different from sacrifice for a political goal, even if that goal is ultimately altruistic. In the context of the immolations, that means if I end my life by burning my body, can I reasonably assume that it will serve other Tibetans in an existential way? Now, if I have come to the conclusion that it is so and if my motivation is really purely altruistic, excluding personal grievance against the regime or some sort of escapism or wrath, then, yes, the act could in principle be in tune with Buddhist ethics. Q: So does Buddhism cover the self-immolations of these Tibetans? A: No, you can’t say that. It is not so simple. What I mean is, as long as the motivation behind the act is genuinely altruistic and the decision to do that was taken in an unaffected mind and to the best knowledge of those who burned themselves, then I can’t see where Buddhist ethics and philosophy would reject that as such. I will assume that they did what they did because they believed it was the right thing to do in the situation they were in. Who am I to judge their motivations? But at the same time, that they believed it was the right thing to do, does not mean it was indeed the best thing to do. To not judge does not mean to endorse in any way. We have to respect their decision, but this does not obstruct us—and in fact, we must also be allowed—to doubt the validity of their decision, or in other words validate or not validate it from our own point of view. Buddhism is a lot about questioning. Actually, questioning is the starting step of Buddhism on a long journey which is supposed to end with Enlightenment. Yet, we can only assess what a person did and whether it was right or wrong from the context and other exterior elements. Their motivations, hence the crucial bit, is beyond our reach and escapes our knowledge. The questions we have to ask ourselves are not whether what they did was right or wrong from a moral point of view. Already because we know too little about them to be able to answer. But the questions we have to ask ourselves are for instance: was their act useful? Were the premises of their thinking, the understandings they had of the situation and which induced them to burn themselves, at all accurate? Again, Buddhism is about questioning and so is scientific analysis. We may not always find ourselves able to answer the questions we raise, but raising them is already a process of realisation in itself. Q: In the December 2013 issue the Buddhist magazine Tricycle featured an article by James A. Benn—an Associate Professor of Buddhism and East Asian Religions at McMaster University and the author of Burning for the Buddha: Self-Immolation in Chinese Buddhism—“Burning for the Buddha”⁴ who used Chinese Buddhist Mahayana scriptures and events within China to indirectly justify the self-immolations of Tibetans as being in line with Buddhist scriptures and history. What do you think about such an attempt and this article? A: I’ve really wondered about that. I will not dispute the central argument of the article, that there is a Chinese Buddhist tradition of self-sacrifice suicides, including by the mean of burning the body, but I will certainly dispute its relevance. First of all, this is not only a Chinese tradition, but an East Asian tradition in general. Most significantly, it is also not only a Buddhist tradition, but a tradition you also encounter among Confucians, Shintos and even some Christians there. That tells me in the first line that we are considering here a cultural phenomenon, not a religious one. It might well have been partly absorbed and even informed by local Buddhism, but that doesn’t make it inherently Buddhist or ‘right’ from the point of view of Buddhism. And even if it was something to be found among Buddhists only, we must remark that not every aspect of localized Buddhism must be in agreement with the core teachings. For example, a certain contempt for Jews has been historically a tradition in many Christian countries, but it is certainly not a core of Christianity. Similarly, were not the crusades a shedding of blood in the very same Holy Land where Jesus once preached Christian love and benevolence? Or in the same vein, the Koran does not exhort religious students to throw acid at the face of a girl, because she visits a school. We need to make here a crucial distinction between the teachings, which the great religious masters passed on, and their deviations and even perversions, which very average humans give birth to while pretending to institutionalize them. To come back to Buddhism, the Buddha accepting food from Sujata and rejecting mortification and nihilism is a crucial chapter on his way towards wisdom and realisation. In the light of that, the monk who burns his thumb or even his whole hand to ‘prove his determination’ appears, at best, silly. Another point to make is that many examples of this tradition of mortification and suicide by fire seem to relate to a strong sense of group identity, in some cases even national identity, and the latter involves at times fanatic fervour. Both have little to do with the core values and teachings we read in the Buddha’s discourses, which everyone acknowledge as authoritative. The Buddha does take national and state structures as given facts, but he doesn’t waste much time on them, nor on any kind of group identity in general. Then, we must also think of representativeness. That there is in East Asia a tradition of people who committed suicide by fire or other means doesn’t make it the normal practice or a practice generally accepted, even there. Last but not least, even if we considered—wrongly—self-immolation as a very central practice in Chinese Buddhism, that does not in any way relate to Tibetan Buddhism. Tibetan and Chinese Buddhism developed very independently of each other. They have very little in common. Hence we cannot draw conclusions on the former from the latter, though this is something Sinologists occasionally do in regard to Tibetan culture and history. I can only imagine tricycle published this article with the idea of stimulating a debate. How appropriate an idea it was, how helpful, I leave you to draw your own conclusions.